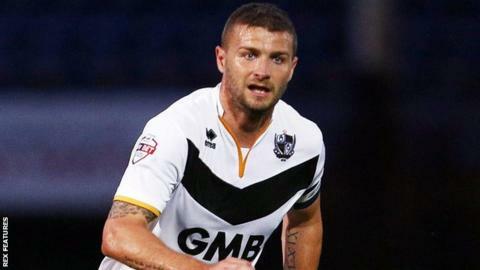 Carl Dickinson scored the only goal of the game as Port Vale earned a narrow win over Swindon to move within a point of the League One play-off zone. The Vale captain headed in Louis Dodds' sixth-minute right-wing cross. Dodds almost doubled the lead shortly after as he shot against the post, while Robins striker Jonathan Obika had a shot well-saved by Jak Alnwick. Fabien Robert went close with a volley after the break, but Rob Page's Vale held on to secure all three points. Vale climb three places back up to 8th in the table, while Swindon remain 17th, six points clear of trouble. "We were far too sloppy in the second half, not clinical enough. It wasn't the best performance but sometimes you have to win ugly. "Even on a bad day like we have had here really, we have proved we can still grind out results. Defensively, our discipline was outstanding. "They have had all the possession. But, on another day, as stupid as it sounds, we might have won three or four nil. Our final pass was nowhere near good enough." Match ends, Port Vale 1, Swindon Town 0. Second Half ends, Port Vale 1, Swindon Town 0. Corner, Port Vale. Conceded by Lawrence Vigouroux. Attempt saved. JJ Hooper (Port Vale) right footed shot from the centre of the box is saved in the bottom right corner. Corner, Swindon Town. Conceded by Richard Duffy. Attempt missed. JJ Hooper (Port Vale) left footed shot from outside the box is close, but misses to the left. Attempt saved. Fabien Robert (Swindon Town) right footed shot from outside the box is saved in the top centre of the goal. Corner, Swindon Town. Conceded by Ben Purkiss. Attempt saved. JJ Hooper (Port Vale) left footed shot from the centre of the box is saved in the centre of the goal. Attempt missed. Jordan Young (Swindon Town) left footed shot from outside the box is just a bit too high. Substitution, Swindon Town. Lee Marshall replaces Jeremy Balmy. Attempt saved. Jonathan Obika (Swindon Town) left footed shot from the centre of the box is saved in the bottom right corner. Attempt saved. Matthew Kennedy (Port Vale) right footed shot from outside the box is saved in the top centre of the goal. Jeremy Balmy (Swindon Town) wins a free kick in the defensive half. Attempt missed. Yaser Kasim (Swindon Town) right footed shot from outside the box is too high. Attempt missed. Jonathan Obika (Swindon Town) right footed shot from outside the box is just a bit too high. Second Half begins Port Vale 1, Swindon Town 0.